Here are a few scores from Craigslist that I found for my clients last weekend. A bamboo style eight-drawer dresser $100, and cane barrel chair $13. Both will get a paint transformation and re-upholster on the chair. she posted these yesterday along with some killer finds from her favorite shopping spot here. 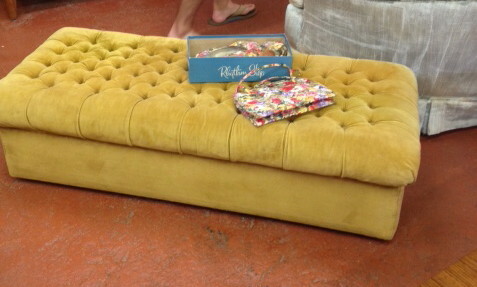 And is this ottoman fabulous or what? Can't wait to show you where all of these will end up! Do you know how to search Craigslist using 'grid view'? See the four boxes below HERE!!! the third one over says 'grid view' click on it. It's much more efficient scrolling through large photos like these. amazing score, Pam. 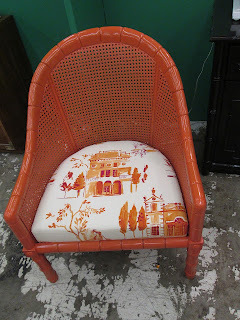 In fact, I did find a great score lately: 6 faux bamboo Chippendale chairs at a killer price. Doesn't it just make you giddy when you find such amazing deals!!! I love your blog and personal style! Thanks for the craigslist tip! I love the cane chair. great score! I love that dresser! I am always hunting....I am getting frustrated with one particular search at the moment. The ottoman looks like it could double as a bed. My family would love that. Those ARE great finds! Awesome to have a client who's good at negotiating, I hate that part. What great finds. Our CL has been so boring lately. I scored a pair of the cane back chairs you featured here (although not as cheap!). I recently discovered the "grid view" and it makes the craigslist scavenger hunt all the more fun! Oh my goodness, that dresser is fab, and so is the chair! And the chair is SO much like the one Sherry posted - that's nuts! I had no idea about grid-view…..going to check that out right now. Okay, I'm back to say grid view is so awesome, I can't believe how I've been conducting searches up until now! You are a lifechanger Ms. Simple Details!!! Pam, in addition to your talented eye for great design, you have such a generous heart to share such good deals with your clients. I am so fortunate to be one of them- thank you for the amazing transformation of our boneless house on budget! What amazing finds! I really need to step up my craigs list searching! Great finds! I haven't found anything on craig's as of late, but I'm sure listing on there ;). You have that special "eye" for seeing fabulous possibilities. Can't wait to see your magic! OMG- thank you so much! I had no idea you could do this! Great finds! I swear you have the best Craiglist around. Thanks for the tip! I LOVE grid view! So much better than squinting at those tiny little thumbnails. I'd have a hard time giving up that dresser, great finds! oh my goodness that dresser is perfect!! thanks for the tip Pam! Love that dresser! Oh wow, love the awesome ottoman. Great finds!